St Vincent’s Hospital is a major hospital in Melbourne’s north east offering a variety of specialty medical and health services within the community. 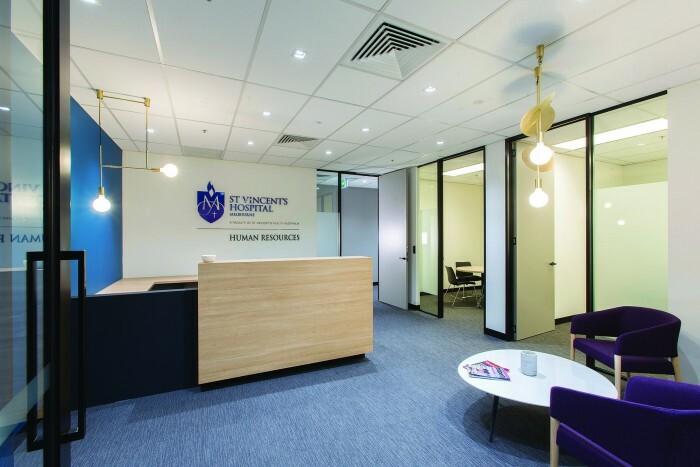 ODC Design was appointed by St Vincent’s Hospital for three fitout projects over a two year period. Initial works involved the refurbishment of an existing reception area to accommodate the relocation of their Payroll Services and Human Resources divisions to Albert Street in East Melbourne. The office space has been configured into two designated areas. Each of the department’s custom made workstations are represented by the effective use of colour for the upholstery. Payroll Services are assigned blue and Human Resources with red. The reception area for Payroll Services was rejuvenated with a fresh display of signage to showcase the hospital’s name, logo and department. Since these two areas are the heart of the hospital, a key objective of the project was to ensure a smooth transition of both services into their newly designed open plan spaces, encouraging a collaborative and efficient working environment. Further major fitout works have been completed by ODC Design at their Albert Street address. This project was to create a sophisticated main reception area where the design flows from the lift lobby through to reception and into the back of house. This project includes a major upgrade of the main lobby, reception, bathroom facilities (including disability toilet) and the addition of a breakout area and large casual meeting space designed to act as a central hub.